With a tagline that said 'Tamora Pierce meets George R.R. Martin' this book had A LOT to live up to. Fortunately, it was completely awesome, so this wasn't a problem whatsoever! It took me about two or three chapters to get sucked into the story, but from that moment all I really wanted to do was READ ON. So while I was really busy, I still managed to read it in 3 days time, I just flew through it! The writing was engaging and kept me turning page after page wanting to find out what would happen next and OMG! how were they going to get out of this mess??? I kinda loved Renee. Maybe I was slightly biased because she and my mom share a name, but still, she was just plain awesome. I loved that she wanted to prove her worth rather than sit idly and rely on her father's connections and the place she could claim in society because of it. I love that she learns to see things differently and can admit she's wrong. I could easily see a girl of 16 making the choices she made sometimes and it was amazing to see her grow as a person through all that happens. So there are some amazing other characters as well, mostly Savoy and his little brother. Savoy is one of those heroes who needs to learn it's ok to have a softer side while being a warrior. He's tough and he's hard on others, but has a firm sense of justice he lives by. I respect that. I may not always agree with him, but I can respect that. Also, his younger brother is all kinds of adorable and I just wanted to reach out and ruffle his hair! I really liked Alec at first, but towards the end I felt betrayed by him and well, I still can't believe he'd turn his back on his friends, no matter the circumstances. I really liked the magic system and the worldbuilding and GAH I JUST NEED MORE! Please let there be more! I need more Renee and Savoy and Tildor and the Academy and just ALL OF IT! I'm not done living in this world through the pages! I really hope this will be an epic SERIES cause I absolutely loved this debut novel! Alex Lidell made me live in the moment with Renee and actually brought tears to my eyes a couple of times and while I'm a huge sap when it comes to romance, other types of novels rarely make me cry, so major kudos to Alex Lidell! 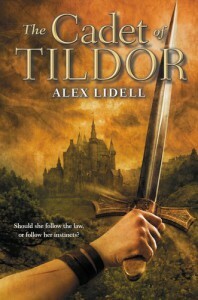 The Cadet of Tildor is everything that makes my fantasy-loving heart happy, highly recommended!